Gotta check your clearance papers a bit better, Selkie. A secret’s no use unless people know you have one. The beam is making a sound, did I read that right? And yup, this is a really bad time for Selkie’s eyes to be glowing, anyone else who’ll see that is likely to draw a connection too. At least he tried, Selkie spilled the beans just to gloat. This may be one of my favorite strips, lol! i agree with selkie, sticking it to amanda is *so* worth it to get grounded for! Great, neither of them can keep secrets. Todd can’t because dishonesty is apparently against his nature; Selkie can’t because she likes to brag. I find Todd’s reaction hilarious. Poor guy, he’s been through a lot today. He’s probably still shell-shocked from nearly being eaten / nearly drowning / finding out his daughter has super powers / realizing she can’t yet control her powers. Unless you know the kid can keep secrets. Some of us are repositories of vast numbers of secrets. It is in the basic nature of retail. 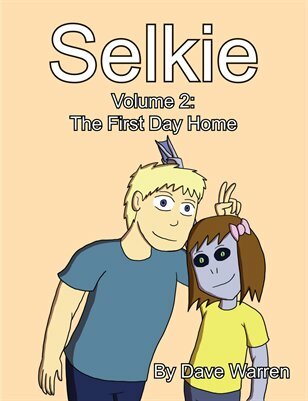 It’s not like glowing eyes could be kept secret from Selkie’s sister for long. Great, now the MIBs will barge in and use the neuralyzer on everybody. Amanda was going to find out sooner or later anyway, so it might as well happen in the most hilarious way possible! On the one hand, Amanda and Selkie are sisters. Amanda’s gonna find out stuff whether the Vast Government Conspiracy likes it or not, and we know she’s already realized some of it. Oh, I’ll be giggling over this exchange for days! Perfectly done, Dave. While Todd certainly needs to get better about getting his story straight, he’s pretty much spilling the beans with Amanda here. After all, she knows quite a bit about what’s beneath the waters. Having been told all about it by a bratty Sarnothi teenager and his mom. I’d like to see that bratty teen’s reaction to this! Might humble him some. I am sad that my daughter will never get to meet Selkie because I swear that is something that she would do. The Sarnothi have just declared their existence to the world. Classified isn’t worth the paper it’s printed on at this point. Which will hold plausibility exactly as long as it takes the Sarnothi to start making demands. She’s a kid who just found out she has powers. Did ya really think she’s going to keep it to herself? XD Especially from the bully who hurt her for so dang long? To be fair, it was established back when in the “Truck” arc(Selkie recovering from being out in the cold and needing her “medicine”) that, while far from knowing anything, Amanda and presumably the other orphanage kids know that Selkie isn’t human. I must be nuts but these interactions between the girls still make me think that within 10 years they are going to be at each others side as sisters and not at odds. Wasn’t pohl supposed to teach her how to turn that off? I assumed he’d do so BEFORE saying goodbye so that she can actually attend school. Maybe schools there are different but none where I am allow sunglasses unless you’re blind. How long till this goes off? Alien is close Amanda, but not quite.